Danny Rose is determined to fight for his place at Pompey. The midfielder is refusing to give up on winning a berth in Kenny Jackett’s side. Rose has made just two appearances for the Blues this season – with only one of those coming in League One. The fans’ favourite is behind Tom Naylor, Ben Thompson and Ben Close in the pecking order and wasn’t including in Pompey’s match-day squad for Saturday’s 2-2 draw with Wycombe. Despite having the opportunity to move to Crawley on loan in August, Rose rejected that opportunity in favour of trying to reclaim a Blues spot. The former Northampton man’s lack of game-time has certainly created plenty of chat among supporters. 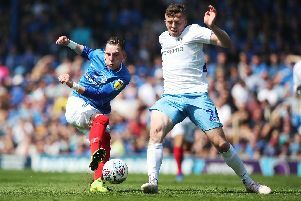 On portsmouth.co.uk and Facebook page Portsmouth FC – The News, the Fratton faithful have been debating if Jackett should hand Rose more minutes. Should never have been dropped in the first place! Switch to a 4-4-2 system at home and play Curtis, Rose, Ben Thompson and Jamal Lowe in midfield and have Pitman and Mason up front. Also Whatmough to replace Burgess and we will have a good starting XI. We are second in the league using the current team so no he shouldn’t be involved at the moment. If form dips then yes he should come in. He looked bad when I last watched him (Blackpool) but we’ve recently failed to boss weaker teams at home so yes, I think he deserves another chance. Yes in place of Ben Close but then again Ben Thompson is a huge talent, quicker in both feet and mind whereas BC is not there yet. Yes, he’s far better than Naylor. Hard to get into a team that is playing well plus quality on the bench but I'm a big Rose fan and he should be in the squad at least. He had a good match in Monday's friendly. Rose is a far better option than Naylor and Close, should be back in the side if Jackett's got any sense. Jackett's been beefing up Naylor but he's been far from impressive since he's been here, can't see why Burton fans were disappointed he went pity we can't send him back average. The cards are really stacked against Rose - which is a shame because he deserves the opportunity to shine again as he did for us last season.